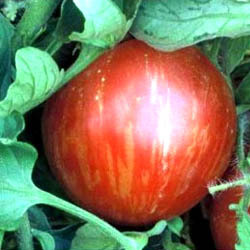 Huge crops of red fruits with clearly defined yellow-orange stripes. 1-1/2 to 2 inch tomatoes have a rich, tangy flavor and are a beautiful novelty for adding whole or cutting into salads. Indeterminate. Tomatoes offer so many delicious possibilities-slice them, sauce them, can them, or turn them into salsa!